2 Why Choose Summer Baby Monitors? 2.1 Why is this cool? Your baby is napping and it’s quiet. Too quiet. You don’t want to open up the door. It’s Summer baby monitor to the rescue! You can peek in on your precious angel without waking them up! 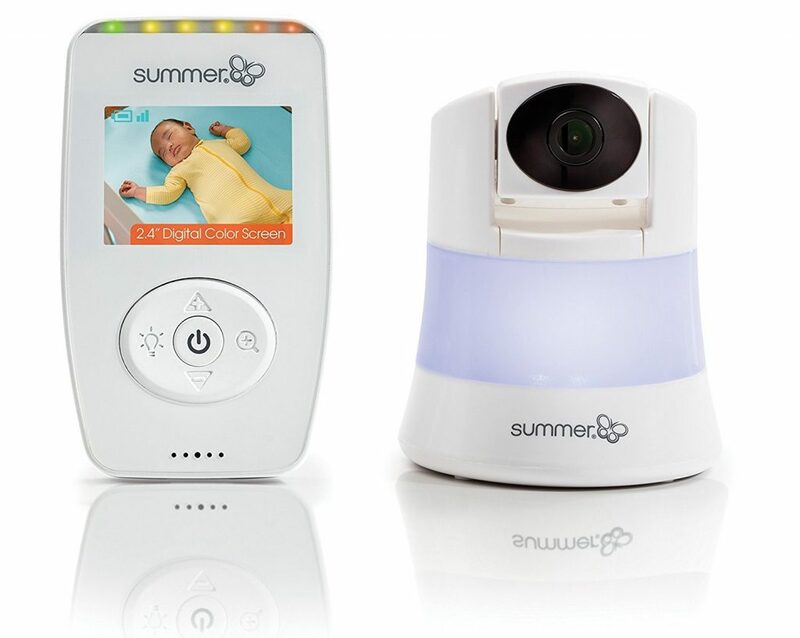 The Summer brand baby monitor has a video camera that allows you to see as well as hear what’s going on in their room. We’ve researched the whole line of the Summer brand and have found these three full-color baby monitors that have the best features and quality for the price. 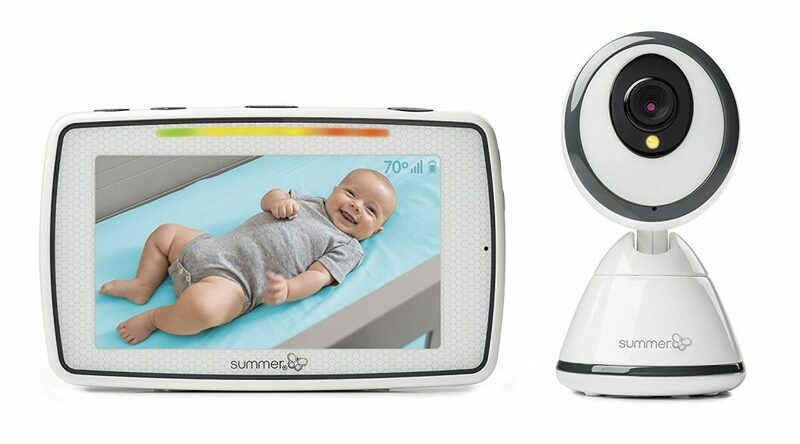 The Summer Infant In View baby monitor is one of my first picks because of the price point as well as the features you get. As I mentioned above, it’s great to be able to see your baby during the day as well as at night. You can add up to 3 more cameras for a total of 4. This allows you to monitor multiple rooms or one room from multiple angles. It has a larger 5” screen on the handheld monitor. There is a belt clip which can also act as a kick-stand allowing the monitor to stand up on a table or counter. The handheld monitor unit allows you to zoom in with the touch of a button. This is helpful if your other hand is full. There are easy to use controls for volume and brightness too. Some people feel that the image was not very clear. This could be caused by some wi-fi interference. There’s no easy way to shield the baby monitor. Also, most baby monitors are now radio frequency based, so you’d have this problem regardless of the brand. The other great thing about Summer brand baby monitors is that they automatically detect if it’s light or dark out. You don’t have to set any switch or setting going from day mode to night mode. If you want a simple to set up a baby monitor with a larger size display, this is the Summer baby monitor for you. What makes the Summer Sure Sight 2.0 so useful is the soft-glow night light built into the camera. It can provide a gentle light to give your baby comfort while they’re sleeping. Like the others from Summer, you can add up to 3 more cameras for a total of 4. There is a small 2.4” screen on the handheld monitor. It has a simple control system that is like the old iPod controls. It’s easy to zoom in and out with one hand. It looks like they had some quality control issues for one year and people were reporting that the batteries would stop taking a charge after a few months. From recent reports, it appears that they have resolved this. The Sure Sight 2.0 has a smaller hand-held monitor. Some people prefer smaller controls that can slip into a pocket easily and pull out for a quick check. If you want an inexpensive yet good quality baby monitor with a simple built-in night light, this is the Summer baby monitor for you. The Baby Pixel is the high-end Summer baby monitor. You can talk back to the baby (or whoever is in the room along with the baby). Even cooler is the fact that you can pan and zoom the camera from the hand-held monitor. Like the other Summer models, the Baby Pixel color video monitor is expandable up to 4 cameras. The Baby Pixel 5.0 Inch monitor also has a 2-color nightlight (pink or blue). The monitor allows you to set boundary alerts. So if your little Houdini sneaks out of the crib, you’ll get alerted and you can put them back to bed. Or at least monitor what they’re up to. Some people feel that the quality of the picture wasn’t very good. I think we’ve gotten spoiled with our high-speed internet and plasma displays. Summer Baby Monitors are using radio frequencies which can’t carry as clear a signal. The Summer Infant Baby Pixel displays the temperature in the room. This can be very useful if you’re concerned about the room getting too hot or too cold. If you want to be able to talk to your child. This may be more important for older children. It’s also useful if your partner is in the baby’s room and you need to chat about something. If you want to be able to pan the camera, this is the Summer baby monitor for you. Also, if you want to monitor the temperature in your baby’s room, this is the model you want to choose. Why Choose Summer Baby Monitors? Summer Infant has been in business for over 30 years. They were founded in Rhode Island by William Lockett III who wanted a safe and simple method of soothing his infant daughter. Her name is Summer. William Locket III invented the Bouncy Seat. From there, they have expanded their product line to include other baby items including baby monitors. Well, if you have more than one child, you can keep an eye on all of them with one monitor. You can also set up cameras in other areas of your home to monitor where your children are playing during the day. These have night vision and the ability to zoom the picture. The ability to see your baby’s bed at night is great if you hear a noise but don’t want to have to go in to check. All the monitors have rechargeable batteries. This is so amazingly helpful since the last thing you want to deal with is trying to find batteries to change out regularly. All you have to do is plug it in & recharge. For all the monitors, you can sync a camera to only one baby monitor because of security reasons. Some people had hoped to be able to sync one camera to two monitors. You can attach more cameras to one monitor. It will cycle through the different cameras every 8 seconds. 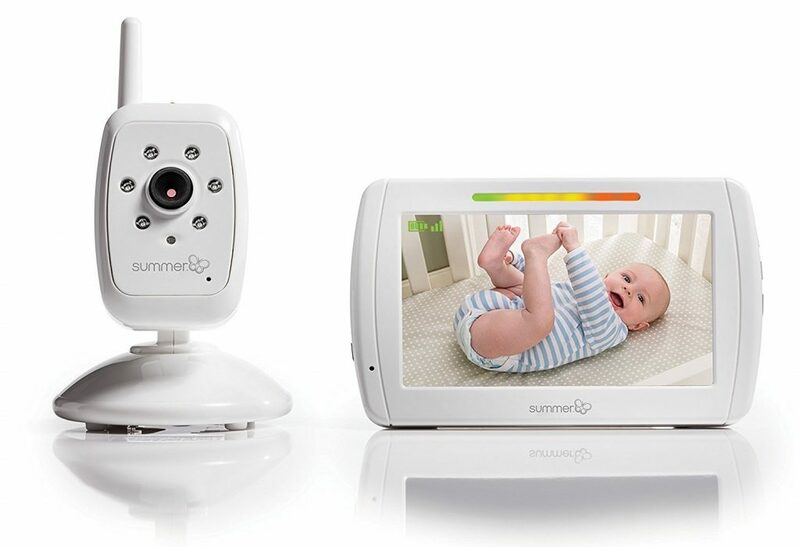 Summer baby monitors are good quality with very useful features. However, due to the limited battery life, you will need to keep the units plugged in for older infants as the baby monitor batteries only last up to six hours. 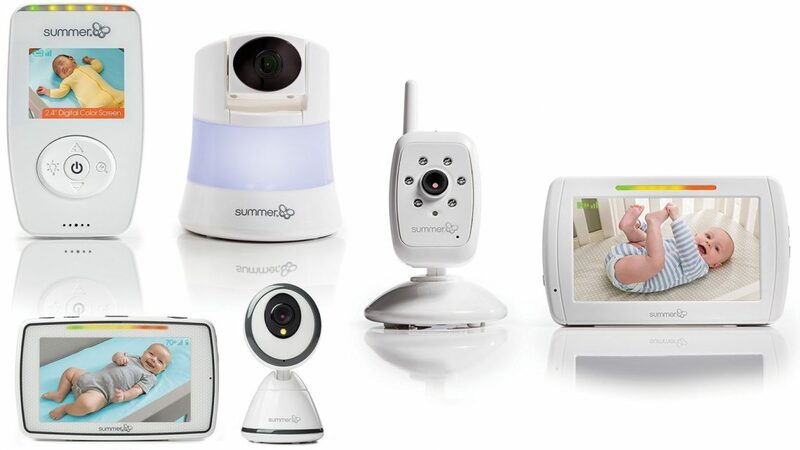 Summer baby monitors also allow you to monitor multiple rooms with multiple cameras and one hand-held device. This gives you peace of mind while ensuring that you’re not misplacing all the monitors and wondering which room the noise is coming from. Whichever model you choose, you’ll be happy at the flexibility of being able to see your baby sleep during the day or at night.